Best Climbers for Toddlers and Older Kids! Top Climbing Toys for Small Children (and big kids too)! What are the Best Climbers for Kids? Are you looking for the best and most fun climbers for kids? Kids love climbing toys, climbing walls and climbing structures! Anything that they can climb, they will! Children are natural born climbers! Naturally their favorite activity is climbing! I was able to find the most fun climbers for kids and toddlers being sold on the market! 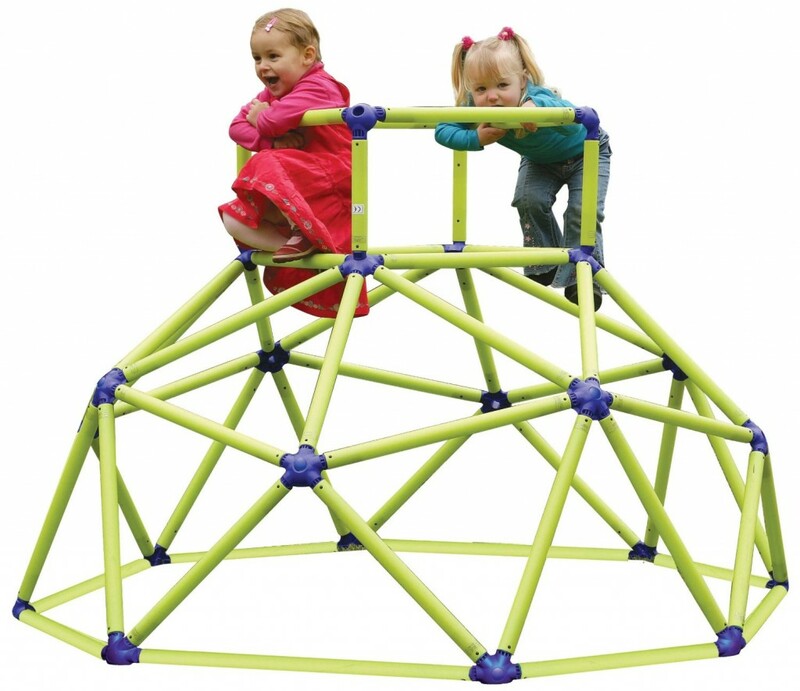 From cute and colorful toddler climbing toys to large outdoor climbing structures for kids, you will find them all here! They are a great way to make kids exercise and spend all that energy while having a blast! If you have an active toddler you definitely know he or she loves to climb things! If you want to keep your toddler very busy and very active in a safer way than climbing doors and furniture, then I definitely recommend giving them a fun climber! What a huge outdoor climbing structure for kids! What a fun challenge for brave little boys and girls! After doing a lot of research I came up with a few of the best climbers for kids ages 1, 2, 3 up to 12 years old! I hope you find a nice climbing structure for your toddler or your older children! Happy Caterpillar Fun Climbing Structure for Kids! This cute purple caterpillar with colorful legs is my favorite climber for children around! Isn’t he a happy fellow indeed? Adults also love him because he is cute and perfect to keep their toddlers busy for hours and hours! 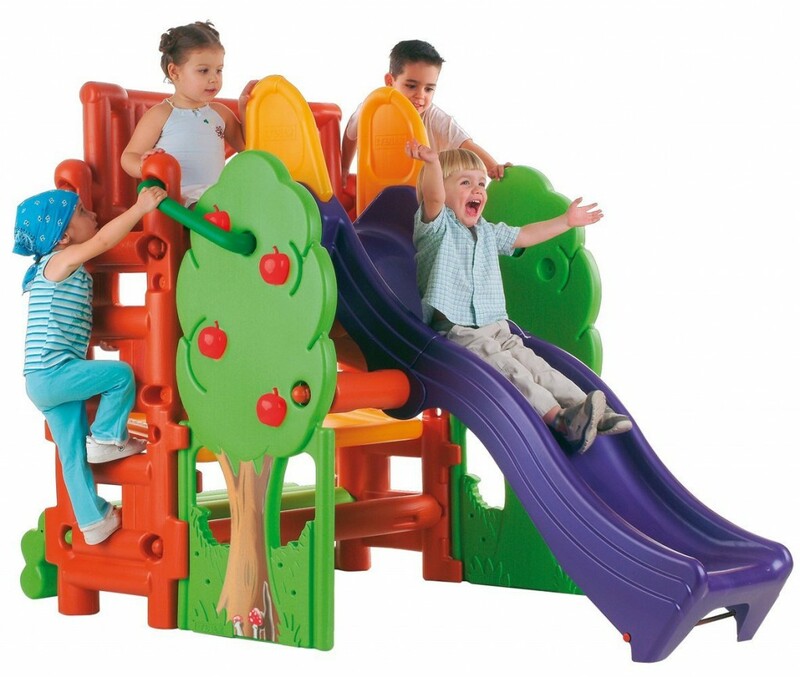 You can have this happy climber indoors or outdoors, at churches, nurseries, day care centers and playrooms! The colorful caterpillar’s ‘boots’ (or legs) will hod him in place. Overall it has 4.5 star reviews by parents and most of them say it was a great purchase! Look at how much fun these kids are having with this cute purple caterpillar! Tree House Climbing Structure With a Cool Slide! Another Fun and Very Colorful Child Climber for Sale! The best climbers for kids are those who also have a fun slide! Just like this fun and colorful tree house climber! Great gift idea if you have multiple kids and a big basement or backyard! Will keep them entertained during the day and tired at night! This fun tree house climber is also a huge hit among kids! Not only it is a great climber, it also has a fun slide! Happy buyer said it’s fairly easy to set up and they found this toy pretty sturdy as well and it’s perfect for play dates! This toy comes pretty much ready to assemble and it includes everything you will need. Step2 Skyward Summit: Awesome Child Climber! Best Climbing Toys for Children! What a fun and unique climber for kids full of real challenges! 4 kids can attempt to ‘climb to the summit’ together! The Skyward Summit (I love the name!) 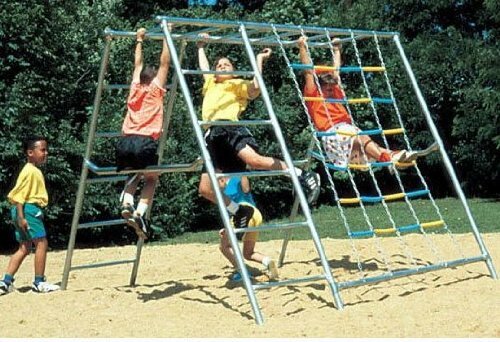 is definitely one of the best climbers for kids being sold! From their height and perspective it will definitely look just like a huge mountain! It has four different climbing walls, each one with a unique challenge for them! Up to 4 kids can play at the same time. I love the fact that it looks very realistic, just like a real rock climbing wall for adults, doesn’t it? Most parents are giving this climber a 5 star review saying that it is a fantastic toy to have in the backyard and the height is just perfect for kids ages 3 to about 7 years old. They said their kids LOVE when they ‘get to the top’ all by themselves for the first time and they feel super accomplished! Parents who have triplets said this is a must-have! Parents who bought this climbing structure for their kids say it’s awesome and they are really pleased! 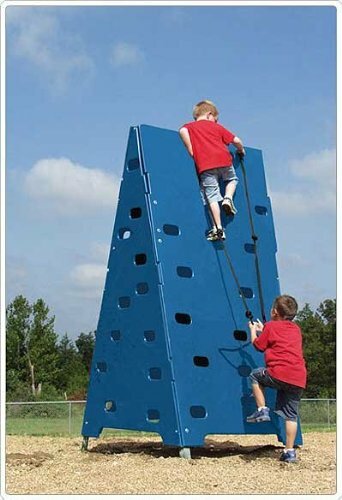 Definitely one of the best climbers for kids being sold! Fits children from 3 to about 7 or 8 years old. Check out these kids reaching the summit! 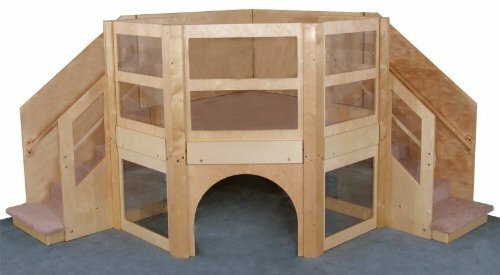 Complete Climbing Structure for Kids Ages 2 to 6 Years Old! This Step2 climber for toddlers is a very popular climber for kids! 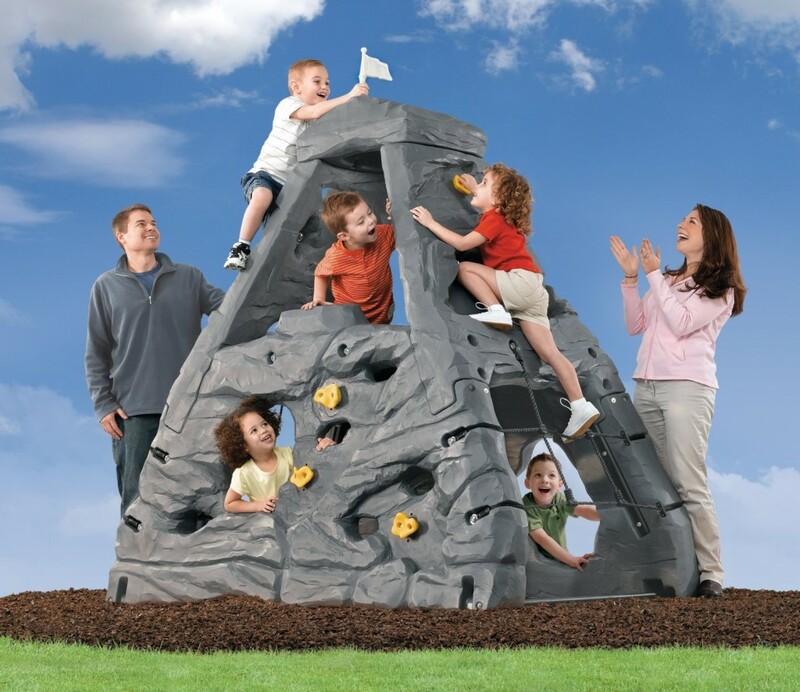 Parents love it and their kids always have a blast climbing, hiding and sliding over and over again! It fits toddlers and small children from 2 to 6 years old! Parents say it is the perfect gift idea for twins or multiple children! Everybody has fun together and there is always something to do! 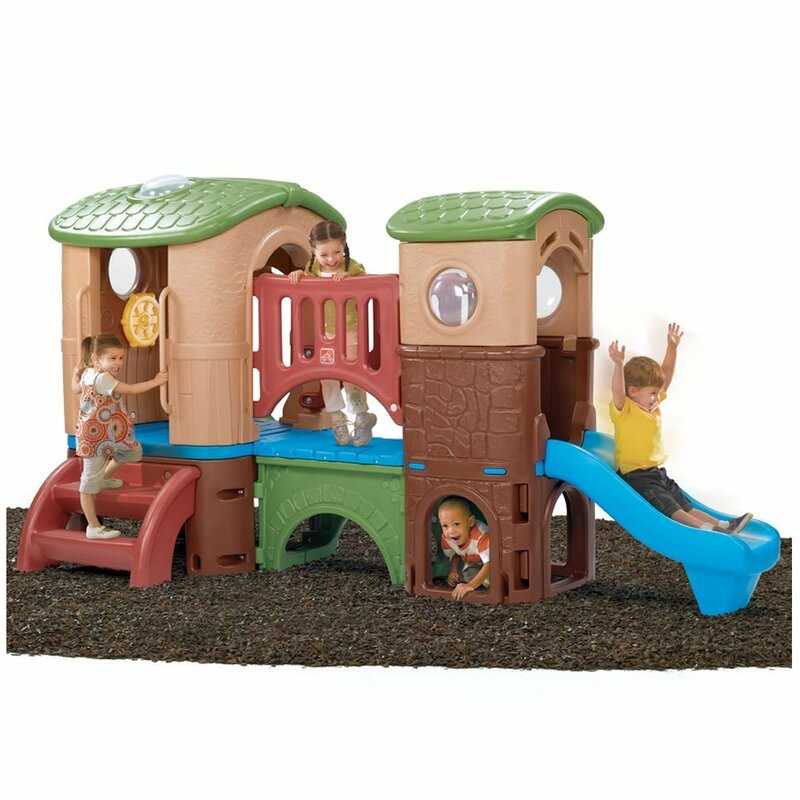 This awesome ‘clubhouse climber’ is a complete playground style climbing toy for children! Kids can not only climb, but also crawl and slide! Great climber toy for twins! Definitely a great choice for a fun playroom! Kids also love to ‘hang out’ on the bridge and check the skylight! Cute Pirate Ship Climber for Toddlers! Who wants to climb a fun and colorful pirate ship? All the little kids do! Look how much they are having climbing this cool pirate ship together! Perfect gift idea for active toddlers! One of the most fun climbers for kids around! 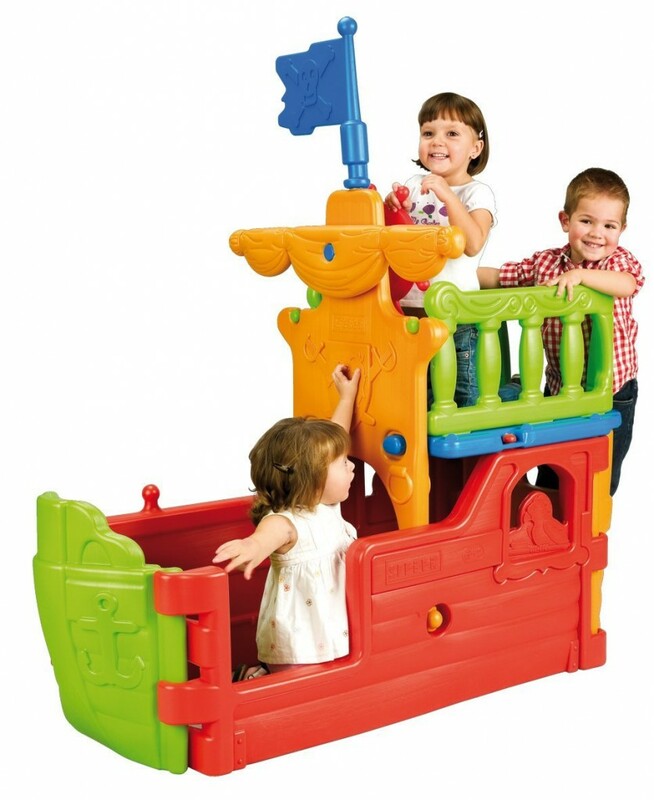 This pirate ship climbing structure for toddlers is very cute, definitely fun for them and very affordable too! It makes an awesome gift idea for a 2 year old boy! It definitely helps with a toddler’s motor skills development and balance! Parents love the fun colors and they say it’s very solid and easy to assemble. It will also look great in their bedroom! I think it will make an awesome Christmas gift idea! Cool Monkey Bars Tower: Affordable Toddler Climber! Fun Climber for Small Children! This is a fun and challenging climbing structure for toddlers and small children! They love to conquer their fear and climb all the way up! It’s also very affordable and very easy to assemble! 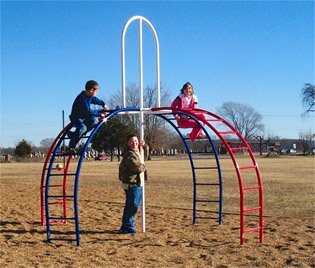 This fun Monkey Bars Tower is also one of the best climbers for kids! It is a classic toddler climber! This one is just right for toddlers and small children from 2 to about 5 or 6 years old. It is very sturdy and also very portable! Best Climbers for 1 Year Old Children! 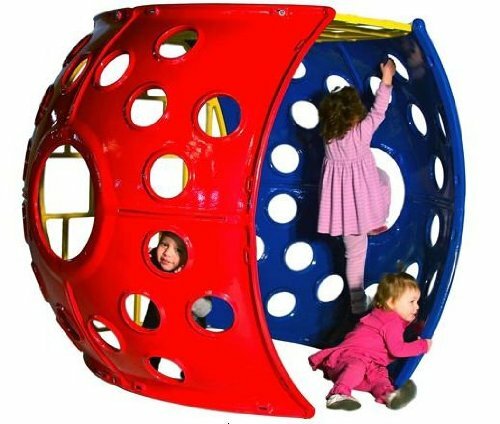 If you have a 1 year old child and are looking for a good climbing structure for him or her, then I think you are going to like this soft corner climber and crawling tunnels maze! It is made from dense foam covered with waterproof vinyl in beautiful primary colors! It is very smooth, very easy to clean and very durable! Even 9 month old children can start enjoying this fun soft climber! Great to have in any playroom! 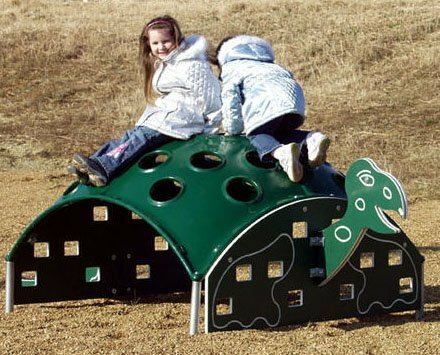 I had to show you this ultra-cool outdoor turtle climber for kids! It fits children ages 2 to 5 years old. Great to have in a day care center or pre-school! 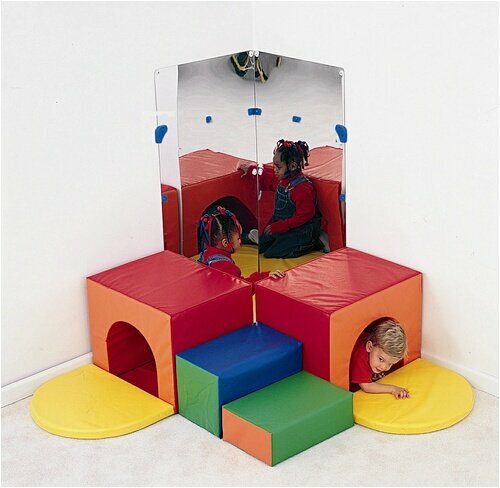 Fun and Colorful Sturdy Play House Climber for Young Kids! This play house climber is definitely among the most fun and sturdy climbing structures for younger children between the ages 2 and 6 years old! The colors are very bright and it’s also a ‘hiding spot’ for them! There are climbing holes all around and also a climbing ladder. The climbing walls are just about the right height to offer the little ones a fun challenge while mom watches them and cheers them on! It fits about 4 toddlers playing at the same time! 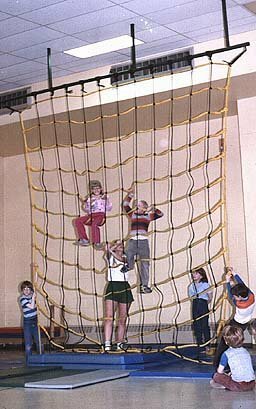 Fun and Affordable Indoor Climbing Net for Kids! Several kids can attempt to climb the net together and they love to compete among themselves to see who can climb all the way up first! It’s perfect for having your kids entertained indoors while you do other activities inside the house. It is very strong and durable and as you can see in the picture and kids love it, of course! Fancy Indoor Wood Climber for Toddlers! This is a very fancy wooden climbing structure with blue carpeting for toddlers! It will fit about 12 children ages 1 to about 4 years old altogether! Great to have in a day care center or a large basement! Best Outdoor Net Climber for Kids Ages 5 to 12 Years Old! If you have older kids and are looking for a cool outdoor net climber to keep them busy and moving their bodies, I think you should consider getting this awesome climber for kids between the ages 4 and 5 up to 12 years old! As you can see many kids can play together and challenge each other, trying to climb up and hold on as long as they can! Great addition to any backyard play set! Quad Climber: Heavy Duty Outside Climbing Structure for Big Kids! This cool outdoor climbing structure took me straight back to the past! Remember these back in the 70’s and 80’s folks? To tell you the truth I could never climb all the way to the top! I was so scared I was going to fall! This fun quad climber is perfect for the ‘big kids’ ages 5 and 6 up to 12 years old! It is great for developing their agility and overall fitness! It requires a lot of concentration and coordination to reach the top and conquer the world! AND slide down the pole, of course! That is the most fun part! *If you’ve got time, check out these pages too!